New patients often remark how relaxed our office feels. That’s good, because our goal is to offer excellent chiropractic care in a comfortable setting. You’ll find plenty of convenient, well-lit parking. You’ll be greeted by name when you enter our office and given a short tour to get you acquainted with our facility. If you’ve already completed your Admitting Forms, great! If not, we will provide you with the necessary paperwork so you can get started. Once this is complete we’re ready to begin. Usually this first visit lasts about an hour. We have a lot to learn about each other! During a brief conversation and review of your health history, we try to determine if you are a good candidate for chiropractic care. We’ll ask a few questions and do a lot of listening. The consultation also gives you an opportunity to tour our office, interview the doctor and learn a bit more about chiropractic. Since ours is a partnership approach to better health, it’s important that you are comfortable with the personalities, procedures and policies of our office. The consultation is a great way to determine that. If we don’t think we can help, we’ll tell you. If we think we can help, and you agree, we can usually proceed to the next step, which is a thorough examination. Our patients appreciate the fact that we explain everything in advance. If our consultation suggests that you’d likely be helped with chiropractic care, we’ll need to perform a complete examination. Our patients often comment on how thorough our examination is when compared with other practitioners they’ve consulted. Our staff will recommend that you wear comfortable, loose fitting clothes to your first visit. The examination will require access to your back and a patient gown will be provided. This is the only time you will be required to wear a patient gown. While not required, it is also a good idea to bring exercise shorts without a zipper, drawstring or other metal to this visit. 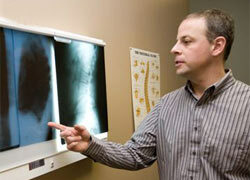 If x-rays are taken of your low back then you will not need to undress to your undergarments. This is a general evaluation that may include the recording of height, weight, pulse, blood pressure, temperature and similar objective measurements. These examinations test your ability to turn, bend and move key joints of your skeletal system through their expected ranges of motion. We’ll test your dermatomes, deep tendon reflexes, muscle strength and other aspects of your central and peripheral nervous system. These tests can include postural evaluations, static and dynamic joint palpation and other procedures to reveal musculoskeletal problems. 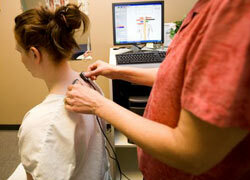 Thermal and surface electromyography are instruments used to locate subluxation patterns by measuring infrared heat and electrical activity in the muscles supporting the spine. Digital pictures are taken to thoroughly measure valuable postural information and develop your Posture Number™. This helps us to provide more specific care to better meet your treatment needs. An evaluation of weight bearing foot mechanics will be conducted. This is helpful when assessing gait and its effect on overall mechanics. This is also helpful to determine if generic or custom orthotics will be utilized in your care. After we review your health history and correlate our examination findings, we’ll review with you all of our findings and make recommendations designed to help you regain and maintain your health. Our priority is to make sure that you have all the information you require to make an informed health choice for you and your family. In certain situations, and in the professional judgment of the doctor, we sometimes make certain exceptions to the flow of this visit. It just depends on your unique situation. Call Goffstown Chiropractic Care, PLLC now to schedule an appointment and let’s see how chiropractic care can help you!